1. Mix the soy sauce and 4 tbsp vinegar in a bowl with the honey, chilli, garlic and ginger. Stir in the tofu and leave to marinate while you prepare the other ingredients. Stir the remaining 1 tbsp vinegar, the carrot and a pinch of salt together in a bowl and set aside to lightly pickle. 2. Meanwhile, set a steamer over a pan of boiling water and steam the pak choi with a pinch of salt for 3-5 minutes until the stems are almost tender. Use the same pan of water to soak the noodles, off the heat, for 3 minutes; drain and stir through the sesame oil. Set both aside and keep warm. 3. Heat the vegetable oil in a frying pan over a high heat. Reserving the marinade, scoop the tofu into the pan and fry for 2-3 minutes on each side until golden. Add the salad onions and cook for 1 minute. Pour the marinade over the tofu and stir until coated. Add the lime juice and cook for 1 minute until bubbling and slightly thickened. 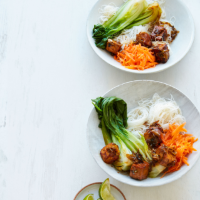 Serve in bowls with the noodles, pak choi and pickled carrots, plus the lime wedges on the side for squeezing over.